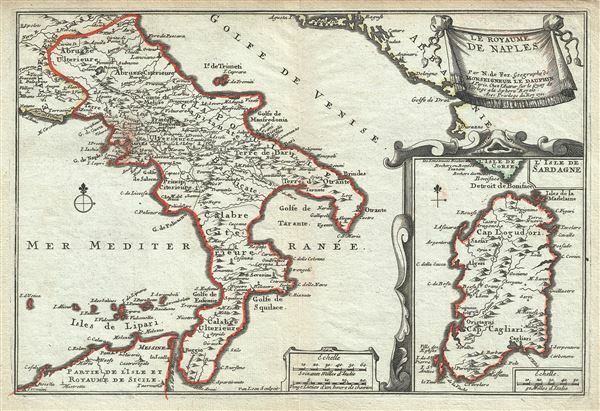 This is a scarce 1701 map of the Kingdom of Naples (officially the Kingdom of Sicily, although the Island of Sicily was not part of the kingdom since the 13th century), in southern Italy by Nicholas De Fer. It covers the southern part of Italy from Ascoli Piceno south to the Ionian Sea and includes parts of the Island of Sicily. A beautifully 'framed' inset in the lower right quadrant features the Island of Sardinia. The map renders the entire region in extraordinary detail offering both topographical and political information with mountains beautifully rendered in profile. At the time this map was made, The Kingdom of Naples was under Spanish control. Following the War of Spanish Succession, Spain would lose many of its territories in Italy, including the Kingdom of Naples and the Kingdom of Sardinia, to Habsburg Austria. The Kingdom of Naples and Sicily would once again be conquered by Spain in 1734, following the War of Polish Succession. Overall, a very interesting and attractive map of the region to appear in the beginning of the 18th century. This map was engraved by Harmanus van Loon and created by Nicholas De Fer for his 1701 Atlas. Very good. Minor wear and toning along original centerfold. Original platemark visible. Minor smudging of outline color near Naples.